Tennis fans rejoice! The US Open Tennis Tournament is nearly upon us and fans are in for a real treat this year. Patrons can expect two weeks of elite competition at world class facilities. 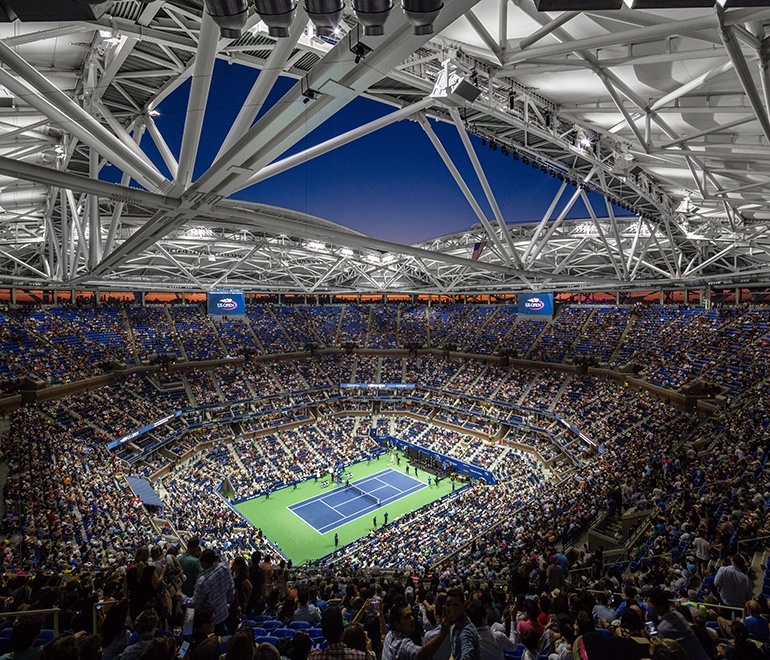 Whether you’re a seasoned veteran or first-time visitor, you likely have questions regarding what to expect when you get to the Billie Jean King National Tennis Center next month. TicketCity has everything you need: scheduling info, stadium and parking recommendations, ticketing instructions, among others. If you don’t find what you’re looking for here, give us a call or send us an email. I’m confident we can help you out with anything you need. There are 22 courts at the USTA National Tennis Center, but the primary courts for the US Open tournament are Arthur Ashe Stadium and Louis Armstrong Stadium. The main court is located inside Arthur Ashe Stadium, which seats approximately 23,500 tennis fans. The tournament is played on a hard-court surface and there is a retractable roof, so rain is no longer an issue. The tournament includes 24 sessions from August 27th to September 9th and each session requires a separate ticket. Courtside boxes (or seats) get you so close to the action that you can often hear the players talking on the court. They include sections 1-67 and the rows on the side start with row AA, then go from row A to row H with each letter having two rows because they are a box. There are fewer rows behind the server, which generally start with row E. A typical courtside box includes four seats in front and four seats directly behind those, but some come with setups of three and three. A courtside box can be purchased as a whole or individual tickets within a box. It is commonplace when you purchase a pair of seats in the 3×3 boxes to have one person sitting behind due to the configuration of the box. The term “box” is just a geographic location in the stadium that is contained by a railing; it is not a luxury box. Courtside seats are some of the most desirable seats at Arthur Ashe Stadium and where the celebrities in attendance will be sitting. Loge level seats are one level up from the courtside seats and provide a nice view of the action. They include sections 101-136 with each section containing rows A-N. Row N contains ADA seating options. Loge Level seats behind the server are often considered some of the best values in the stadium. The top level at Arthur Ashe Stadium is the promenade, which includes sections 301 to 340 and up to 25 rows per section. The promenade offers a clear view and allows you to still feel the electricity of a US Open match. Arthur Ashe ticket holders also have general admission access to other courts as well as the full grounds of the tennis center. For several (earlier) sessions you can often find reserved tickets for about the same price as grounds general admission. While the roof certainly helps block some of the sun, reserving tickets in a shaded area during daytime sessions is still a great idea. Fans will want to shop for seats on the south and west sides of the stadium. For reference this includes sections 123-136 and 101-105 (as well as the promenade and courtside equivalents above and below). Because of the roof, higher sections/rows are often shaded first. This year fans will get to experience a brand new, 14,000-seat stadium that also includes a retractable roof. There are two levels of seats in the stadium: a lower level of reserved seats that are ticketed in advance and an upper level of general admission seats that are filled on a first-come first-served basis. This year there will be numerous large matches played in Armstrong including several night matches (for the first time ever!) 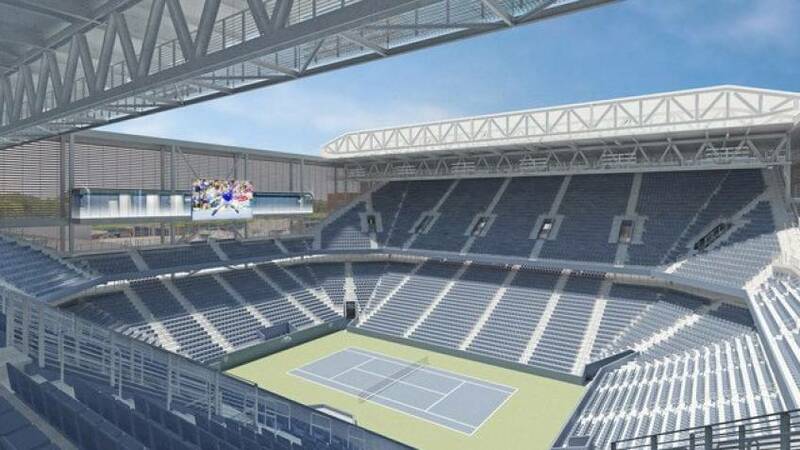 so fans who hold Arthur Ashe and/or grounds passes will want to arrive at the court in advance of the match they’re hoping to see to get the best seat possible. Like Arthur Ashe, the south and west sides of Louis Armstrong will be shaded first during day sessions. This includes sections 1-7 and 17-18. Higher rows will also be shaded first due to the roof. What is the best way to get to the tennis center? The US Open is played on the grounds of the USTA Billie Jean King National Tennis Center in Flushing Meadows, which is located in the New York City borough of Queens. The quickest way from Manhattan is to either take the #7 subway train or the Long Island Rail Road (LIRR). The #7 Flushing-bound train lets off at the Mets-Willet Point station, which is a short walk from US Open. The LIRR is more expensive, but more comfortable and direct trip that leaves from Penn Station. Car services are available, or you can drive yourself, but there is usually some traffic and parking spaces are limited. Parking passes are available at TicketCity- contact us for more info.